A spacious villa in a Colonial inspired complex. 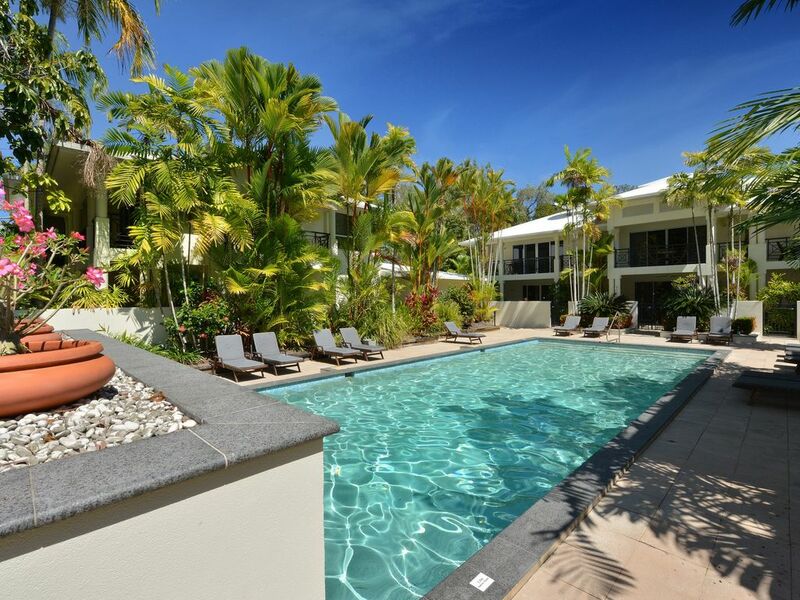 Plantation Villa 8 has an unsurpassed beachfront position on Four Mile Beach. On the ground floor, the open plan kitchen, lounge and internal dining area have direct pool access. The covered patio includes outside dining, BBQ and a day bed perfect for relaxing in the heat of the day. Crisp, white architectural lines and lots of tropical landscaping reinforce the Colonial style and the high ceilings take advantage of the warm ocean breeze. The kitchen features European appliances and granite bench tops and is fully equipped to cater for every occasion. Cupboards are fully stocked with china, glassware, cutlery and cookware. The lounge has an entertainment unit which includes Plasma TV, DVD and CD. On this ground level, a Queen bedroom and Twin singles share a family size bathroom. There is also a full laundry. Upstairs, the third bedroom has two single beds that can be converted to a king. The master bedroom, complete with a spa bath in the en suite, a walk-in-robe and TV, has access to a private balcony with pool and beach views. Superbly appointed with colourful accessories, eclectic artwork and comfortable handcrafted furniture, the villa is the epitome of tropical style. Full air-conditioning, ceiling fans and sisal carpet throughout the villa is equipped for a comfortable stay. There is undercover parking and security access via Andrews Close. Easily accommodating eight guests this villa is a great getaway for two families, or discerning guests who want resort quality without the crowd.